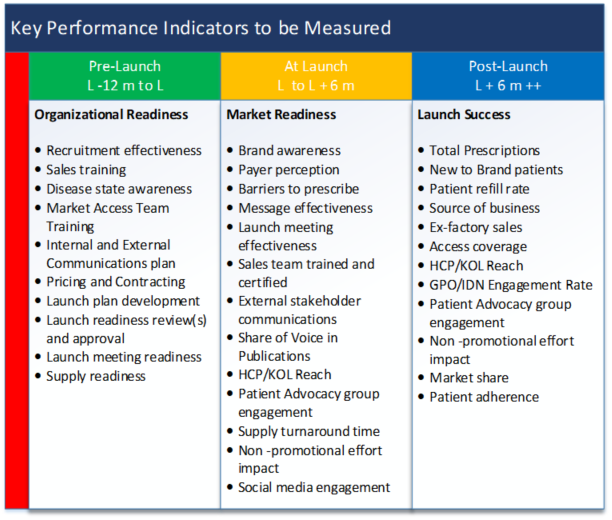 KPIs, or key performance indicators, are critical to the success of a pharmaceutical product launch. 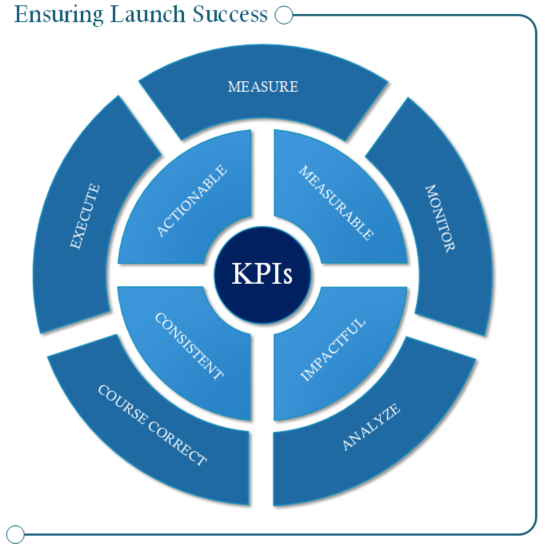 By their very definition, KPIs are measurable values that demonstrate how effectively a company is achieving their business goals – in this case, a successful product launch. Of course, there are many KPIs that can be tracked over the course of a launch, but only a handful are truly vital for measuring the overall success of your product’s introduction into the marketplace. Ideally, eight to 10 KPIs should be identified for each of the three product phases: pre-launch, at launch and post-launch. These KPIs will provide true success measures of the overall launch and – eventually – of brand performance. AT LAUNCH: Lasting only about six months, the at-launch phase is the shortest but most important. This is the point at which stakeholders really dig in to ensure the product is market ready and properly positioned to succeed in a competitive environment. It is during this phase, that the critical launch curve – the ultimate measure of success for a new product – is defined. POST-LAUNCH: Starting approximately six months after your product is introduced to the marketplace, and lasting for nine to 12 months thereafter, the post-launch phase is a period of analysis and scrutiny. During this time, the product is continually monitored so that modifications can be made as necessary, with one end goal in mind: brand success. Once the individual pre-launch, at launch, and post-launch KPIs are established, they are then tracked, monitored, measured, and assessed. At the end of each phase, the resulting data is evaluated, which allows the launch team to clearly quantify a product’s success. 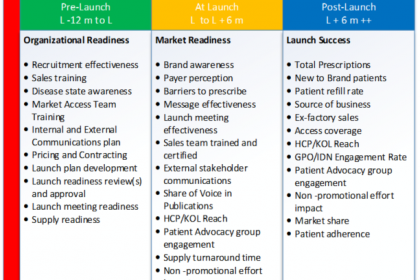 When examining recent pharmaceutical launches – ones that have hit the marketplace over the past few years – there are several clear examples of unsuccessful product launches, and many of them have the same thing in common: critical KPIs were not set, measured, or tracked. Gazyva received approval from the FDA in November 2013 for a breakthrough therapy designation. Because of the strong safety and efficacy review during clinical trials, the FDA requested that Genentech accelerate the launch of Gazyva by six weeks. This was a struggle for their team because they did not have a supply readiness KPI in place to ensure that supply was available when required. Ultimately, the product launch team worked closely with its internal teams and the FDA to obtain the necessary supply, and they launched earlier than planned, but it was more of a challenge than it needed to be, due to the lack of a supply readiness KPI. Toujeo, insulin glargine U300, was approved by the FDA in February 2015 and launched in April 2015 to the same patient segment that currently was prescribed a drug called Lantus. PCPs prescribed Lantus to patients for whom they were not comfortable giving a higher concentration of insulin. At the time of the product launch, Sanofi decided to stop promoting Lantus in favor of the newer drug. Meanwhile, despite price parity between the two medications, physicians were skeptical of Toujeo’s mechanism of action. As a result, Sanofi lost market share to competition, and a year later, the pharma company ultimately had to re-introduce Lantus due to the unsuccessful launch of Toujeo. Had a launch readiness KPI been in place for this product portfolio, Sanofi could have avoided the negative impact on its business. If you need any help defining KPIs or understanding what KPIs would be beneficial for your business, CMK Select can help you.